When you create a YouTube publishing destination, one of the default properties that can be set is the YouTube privacy setting. By default, there are three options, Public, Private and Unlisted. When videos are published to YouTube, the privacy setting for all videos will be set to the selected setting. You may have a cases where the YouTube privacy setting for each video should be different. In this case, a custom field associated with the video can be used to control the privacy setting allowing each video to have a different privacy setting. When the video is published to YouTube using Brightcove Social, the privacy setting will be set to the value specified by the custom field value. Note: Custom fields are available only to Professional and Enterprise accounts. 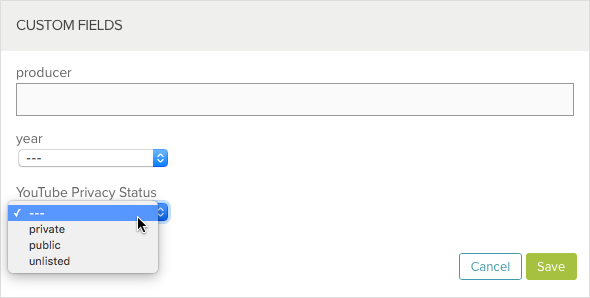 Tip: By using a List type for the custom field, users will be able to select the status using a dropdown list vs. having to type a value in. Once the custom field has been added, the value can be set using the Media module. Edit the YouTube publishing destination and set the Privacy Setting default to Use YT_Privacy_Status Custom Field. When a video is selected and the YouTube destination is selected, it will have the privacy status that was set using the custom field.